Transporting secondary packaging is now safer than ever thanks to this overlapping link chain which, even around curves, leaves no open gaps and needs no supplementary guards. The new C136 safety chain is the ideal answer to your need to combine performance, safety and value for money. Not only for new installations, it also retrofits easily in place of standard chains of the same width and pitch. 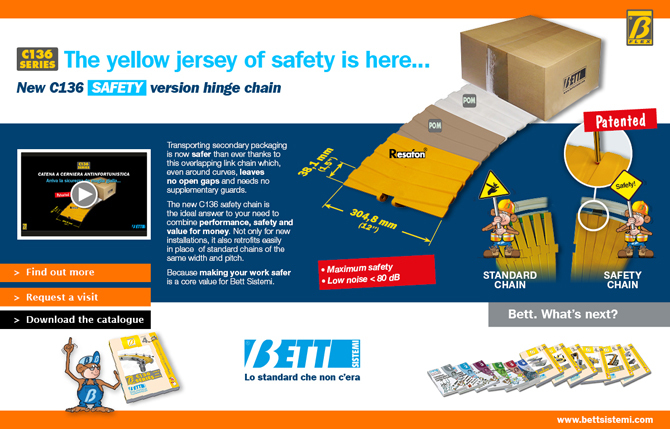 Because making your work safer is a core value for Bett Sistemi.